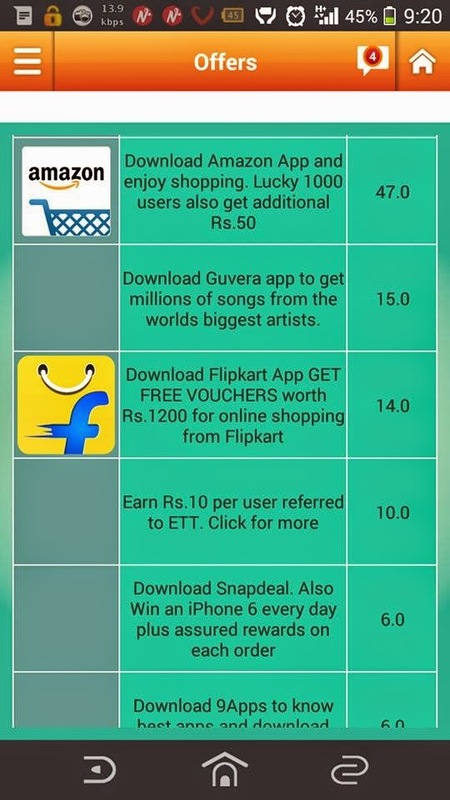 Today we are sharing one of the highest recharge paying Android App. Many of you might be familiar with this but its for those who are still unaware about this. This application is named 'Earntalktime' which is 100% genuine and gives recharge for downloading Android Apps through them. They also pay high amount referral rewards which will be shared in this post. Now open that application and register & verify your mobile number. After successful mobile verification you are ready to earn free mobile recharge. Now when your verification procedure completes you will see you homepage. Click on Offers to check offers by which you can earn free mobile recharge. Download Amazon app to get Rs. 47. Download and open it for at least 1 minute to get your reward. There are many application which pays up to Rs. 10 for downloading it. Simply download any app through Earntalktime and open app for 30 seconds to get your reward. So refer as many friends as you can to earn unlimited free mobile recharge. It have a feature of getting loan if you balance is in between Rs. 0 to Rs. 9 for Rs. 10 and if your balance is between Rs. 11 to Rs. 19 then you can take loan to get Rs. 20. It will be adjusted in later activity. To avail recharge you need to have balance of Rs. 20 before recharge.